With mediAvatar Apple TV Converter, you can easily transfer your movies and music videos to Apple TV and enjoy them on your wide TV screen now by converting almost all video formats like AVI, MPEG, WMV, RM, RMVB, MOV, MKV, etc. to Apple TV MP4 (MPEG-4, H.264), FLV and MOV videos. Moreover, it can help you get Apple TV MP3, M4A, AIFF, AAC and WAV audios from most video and audio formats and create videos from picture files like JPG, GIF, BMP, ect. 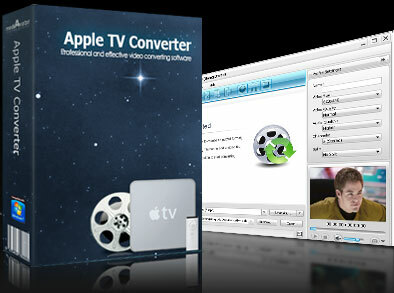 Convert other videos/audios to Apple TV MPEG-4, H.264/AVC video and MP3 music. * Detecting CPU configuration automatically, mediAvatar Apple TV Converter provides you with super high speed to convert Apple TV videos, and the conversion speed increases with the CPU performance. * To output custom files, mediAvatar Apple TV Converter offers rich adjustable output parameter settings like video/audio quality, channels, bit rate, frame rate, etc. * By adding multiple profiles for the same source at one time, getting different formats from the same file becomes pretty easy. * Set the start time and duration to get any desired video segment for converting. * The built-in Bitrate Calculator tool makes it easy to get video file converted in exact size. * Split the larger file into several parts by given size or time according to your own need. * Take a snapshot when previewing the source video and save it as BMP file. Convert Apple TV Video from all popular video files. It is multifunctional and fast Apple TV Video convert software. Qweas is providing links to mediAvatar Apple TV Converter 6.0.9.0802 as a courtesy, and makes no representations regarding mediAvatar Apple TV Converter or any other applications or any information related thereto. Any questions, complaints or claims regarding this application mediAvatar Apple TV Converter 6.0.9.0802 must be directed to the appropriate software vendor. You may click the publisher link of mediAvatar Apple TV Converter on the top of this page to get more details about the vendor.